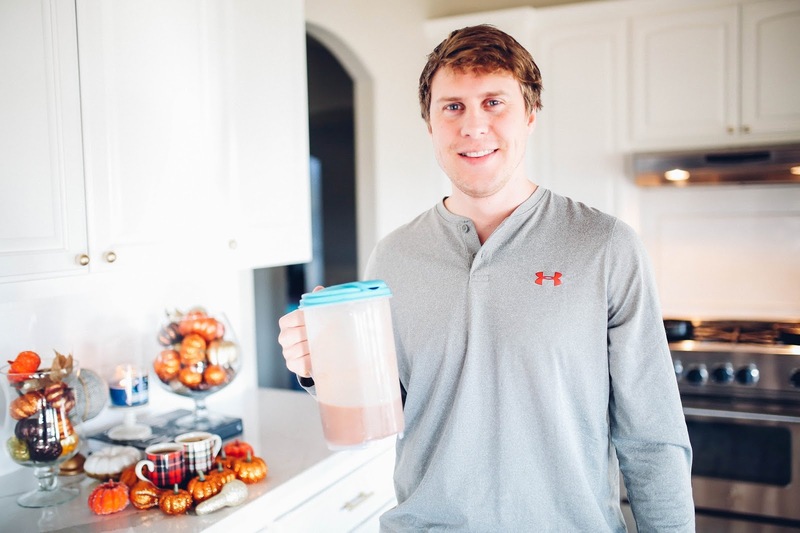 John doesn’t drink coffee at all but loves hot chocolate so last month we tried some different hot chocolate recipes. 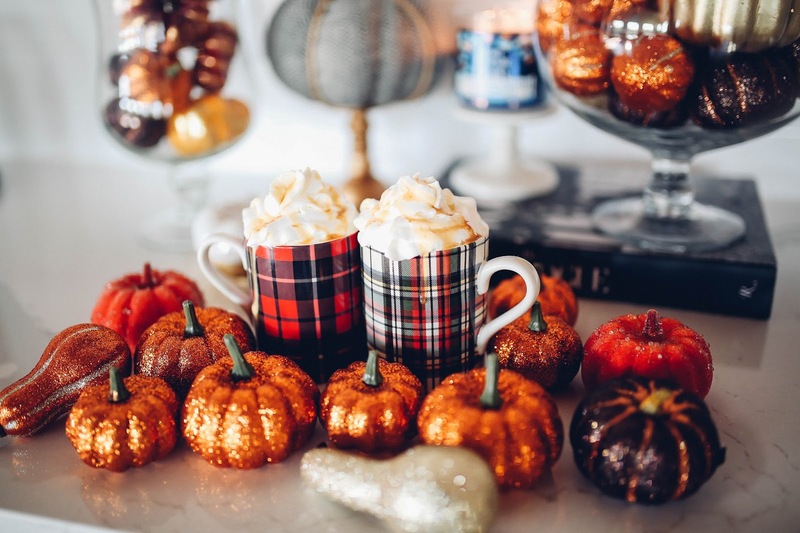 Its the season for festive, hot drinks and I wanted to have some fun drink ideas for family gatherings. 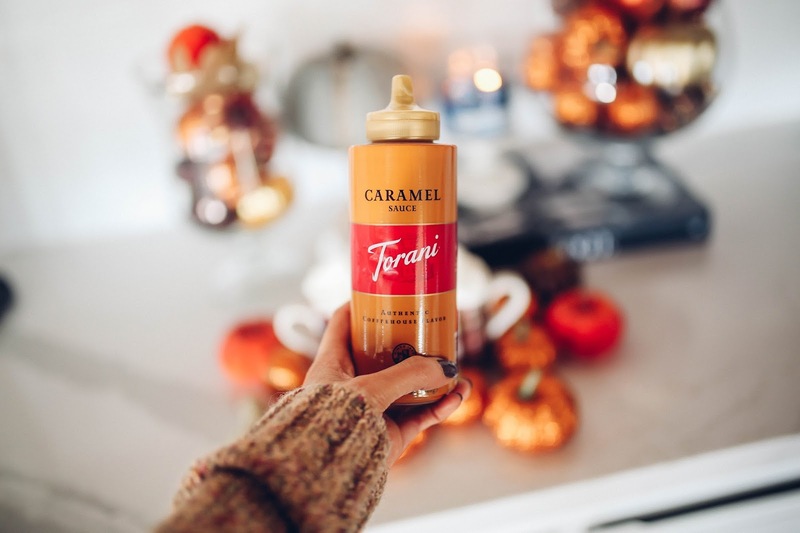 Anyway, we ended up loving this salted caramel hot chocolate recipe. What’s great is that you can refrigerate it and warm it up later! We I didn’t follow the exact directions (I hate directions) so I just bought all of the products and then winged it haha! It may be even better if you actually follow the exact steps! 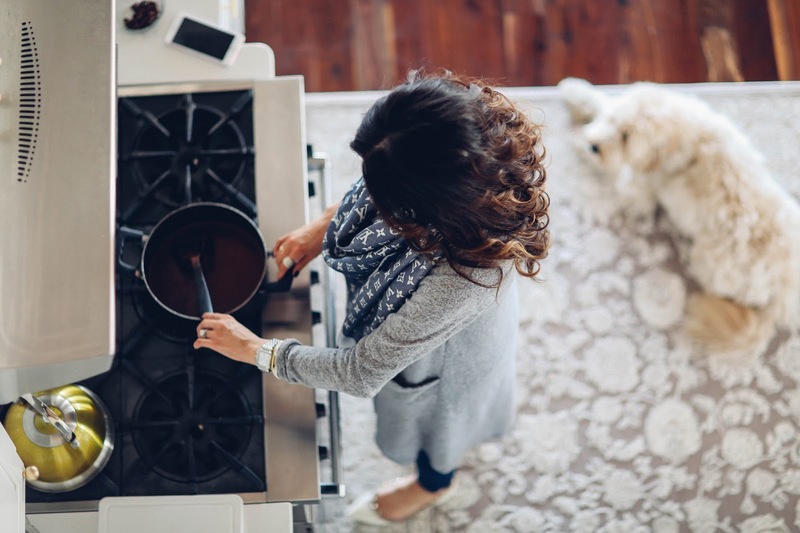 Let me know if you try it and love it – or comment below with some of your favorite hot drink recipes for the Thanksgiving and Christmas holidays! This weekend we are heading to Arkansas to spend the weekend with family and go to the Razorback game! So glad you'den sharing this! It's starting to get cold, so it's perfect timing. Great post…but yet all your posts are great! I love that you pup got to enjoy the fun as well! Beautiful! Sounds delicious! It's still waaay too warm here in Alabama for hot chocolate, but I'll have to try it out when it cools off! Ah love this post. Fitz is the cutest as usual:) Will have to try your recipe soon, thanks for sharing. I love how different this post is for you! Very very cute! 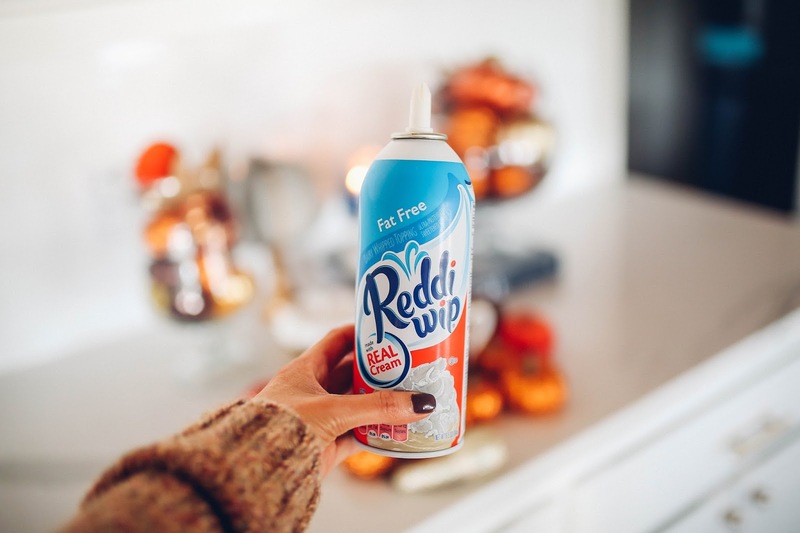 Thanks for the recipe, will be perfect for these season's festivities! 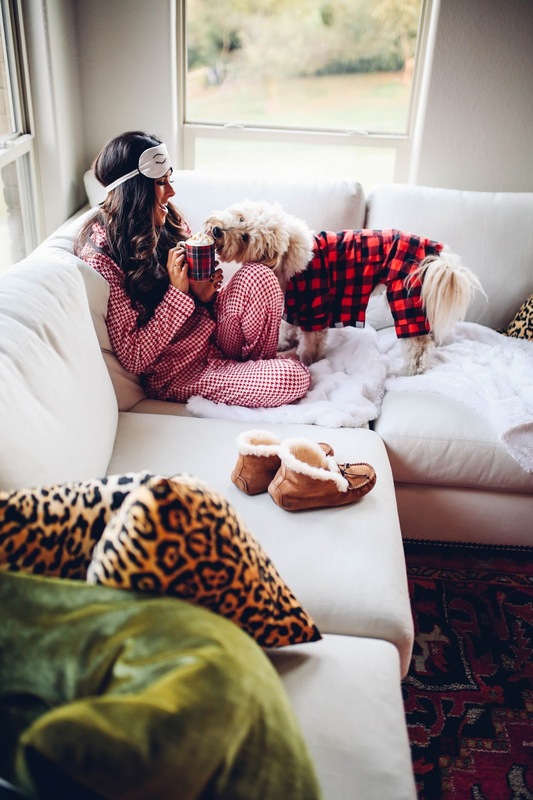 Love how cozy and chic your home and pjs look! ???? Love the post! I know that aerial shot had to be hard.. but it's very unexpected and original! I loved it. About your couch though.. What color did you get it in? I've been looking at that one for quite sometime trying to decide on the color. 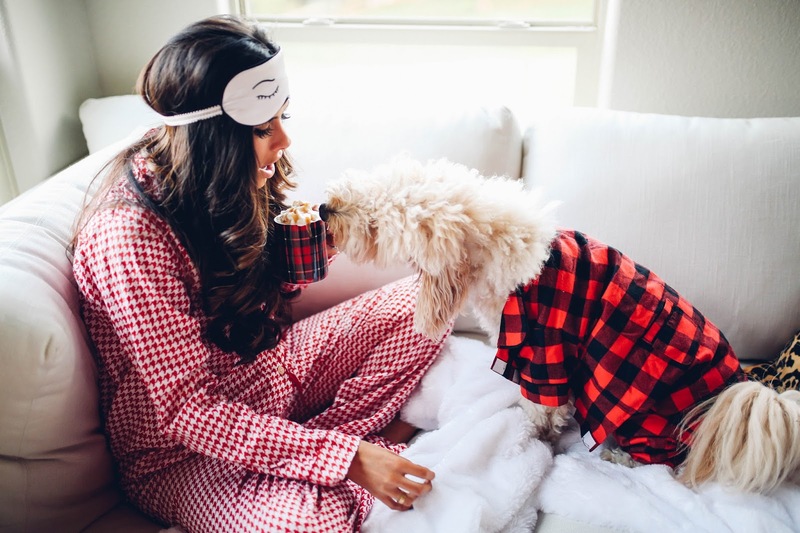 OMG those pajamas!! SO IN LOVE. 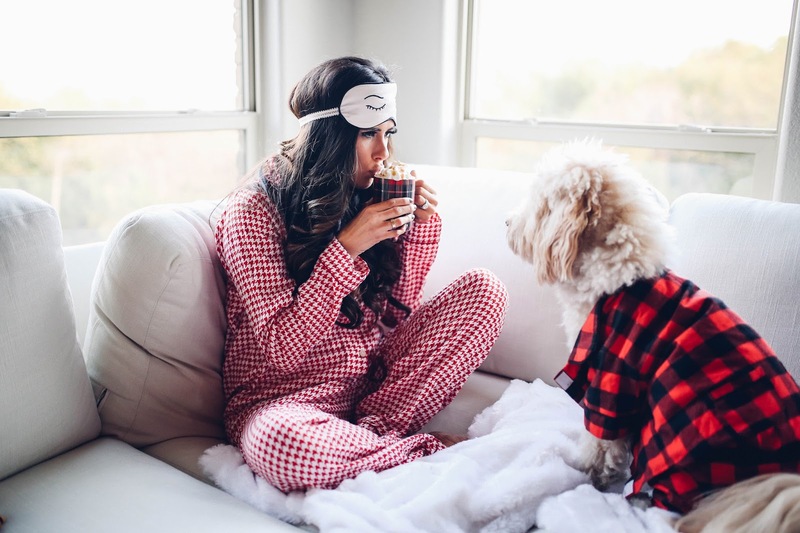 Literally getting those for sure because I don't really have pajamas but I've always wanted a cute pair for the Holidays and as it gets colder at night! Yay!! That seems like a delicious recipe. I need to make it soon and try it out. Love these photos! 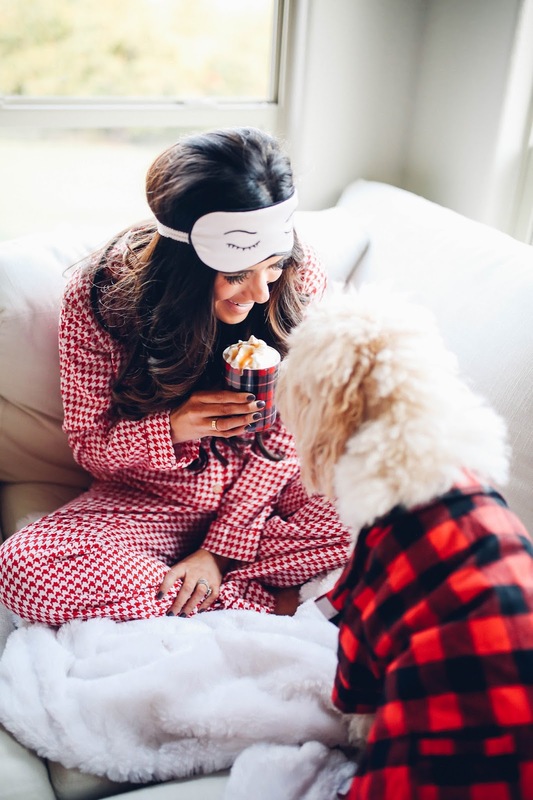 I love the pajamas! Really cosy! I really have to make this recipe, sounds delicious! Love this post!' So fun and festive!! Really gets you in the holiday mood !! 2 questions, 1st dying to know that nail color… So beautiful!! And 2 I thought you had posted about a rug very close to that from Nordstorm that you were changing out for the holidays?? So I was surprised it was linked to a different site? 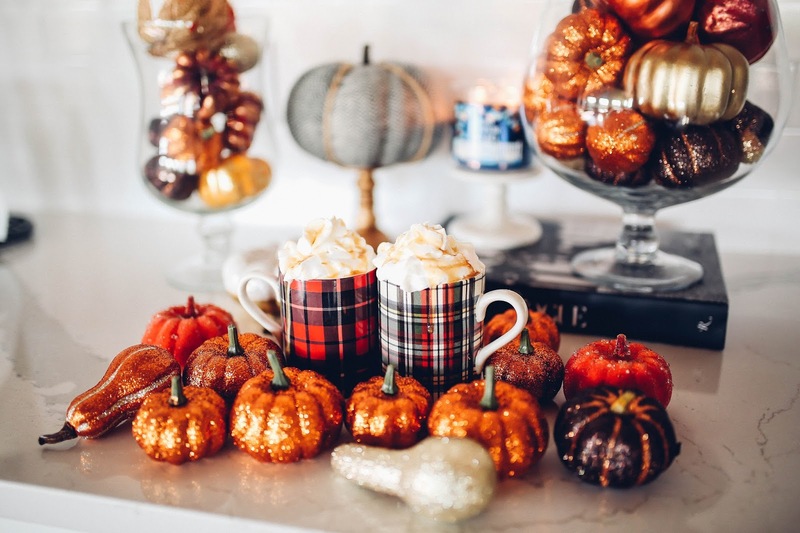 Can't wait to see more holiday decor, gift guide and looks!! So blessed I found your blog!! Has changed my life and my wallet…???? But ALL WORTH IT!! I've recently cut back on my coffee intake (It was a little out of control lol) and I've been living off of hot chocolate, so I will definitely be trying this out!!! Sound so yummy and those pictures are adorable!! Have fun with your family this weekend! 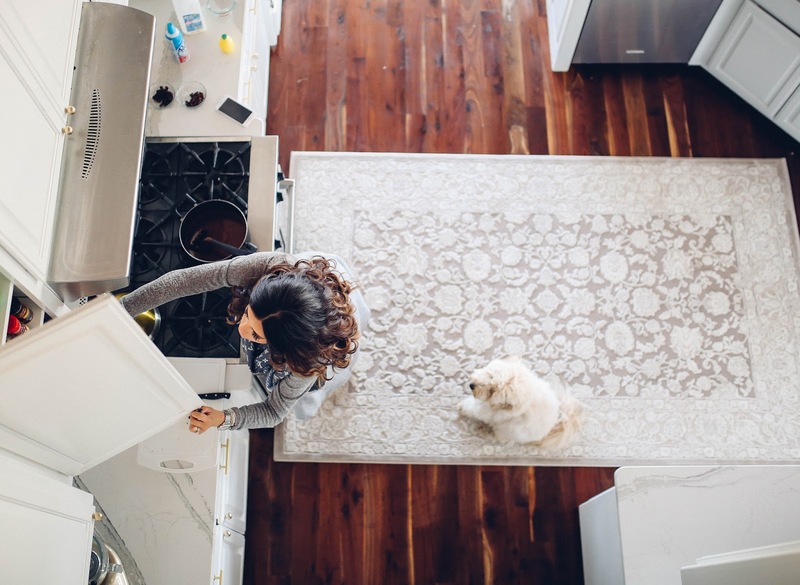 Love the rug change in your kitchen!! It's gorgeous! I love hot chocolate. I tried making a red wine hot chocolate a week or so ago and it was just AWFUL. It was so thick. It was almost like trying to drink pudding. I'm definitely going to give this recipe a try this weekend. That sounds so warm and cozy, now I'm totally in the mood for hot chocolate. I'll have to make this one night. I love that you can refrigerate it and warm it back up! Thanks for sharing this! I love salted caramel! Great post! Do you use your 50 mm lens for all of your photos? Hi Emily, I love your kitchen rug and am looking for a neutral rug for my bedroom. I noticed the link you provided isn't your exact rug, is yours no longer available? I would love to find it! Thanks!! Do you know the name of the rug? There are so many options with the link that it's hard to find lol. Such a great post!! I love your lifestyle ones. Such a great way to switch things up. I love your blog, you have great tips. I love your kitchen rug, can you please share the name of it? The link doesn't take you specifically to that rug. Thank you! What is your nail color?! I'm obsessed! 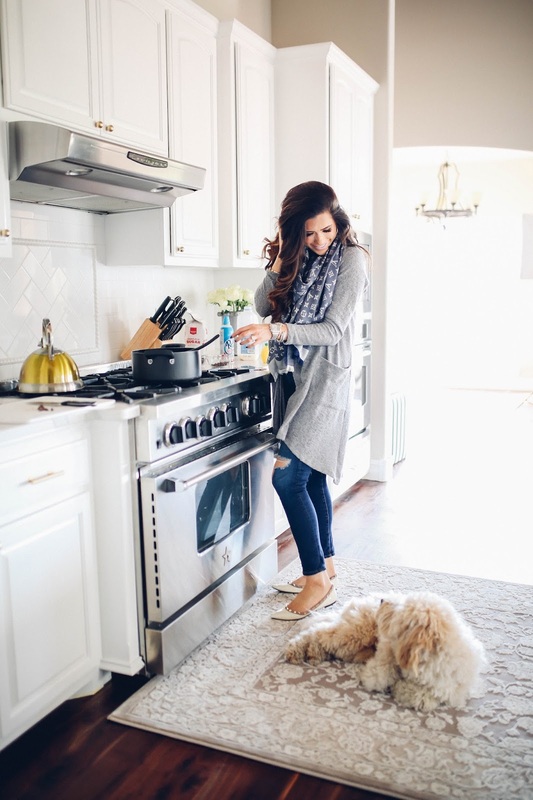 I am so excited to try out this recipe it looks delicious <3 Also, you puppy is the cutest and I am kinda in love with that fact that you guys are matching! Adorable.